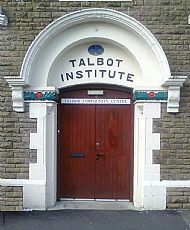 The Talbot Community Centre is a former Miner's Institute and a true community centre, as it is owned and run by the local community, for the community and most of the people involved are volunteers. The former Talbot Miners' Welfare Institute, was a gift to the village from the Talbot family in 1911, it remained as a Miners Institute until the last colliery in Kenfig Hill closed in 1959, it then fell into disrepair and was closed for several years before a group of community volunteers decided something needed to be done with the landmark building. After receiving grants from groups like the Big Lottery and other support the Grade II listed building was reopened in 2005.